Breathing Space is a mobile program that offers classes at schools and community venues around the Washington DC metro area. We are looking for a few more team members in a variety of capacities. 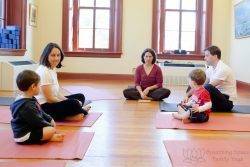 Children’s and Family Yoga Instructors – We frequently have openings on Capitol Hill for after school and weekend kids (ages 4+) classes as well daytime opportunities for early childhood (newborn-4 yrs). Apply! Winter 2019 after school class opportunities range from preschoolers to middle schoolers. Most opportunities are 1 hr classes are scheduled at either 3:30 or 3:45 pm starting in January and running through March, with an option to renew through June. Openings include schools on Capitol Hill, NE and NW DC, and in Maryland and Virginia. 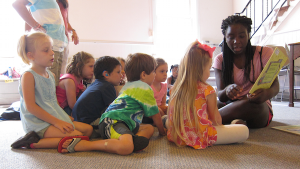 Early childhood opportunities could include weekdays or Saturday mornings. Prenatal Yoga and Postnatal Instructors – We are looking for guest instructors to occasionally fill in for our prenatal and postnatal yoga classes on Capitol Hill. Our guest instructors are we where we turn first to fill permanent openings Our current class is Thursday evenings at 6:30 pm, but there may be opportunities for expansion in the future. Apply! Yoga Camp Teachers and Aftercare Coordinators – We are looking for experienced fun-makers to help run our DCPS day-off and summer camps. Teachers work with the camp director to develop and execute activities to fit the camp theme. Experience teaching camps, arts and crafts, games, or outdoor activities highly desired. Candidates must be 18 years or older and pass a background check. Yoga teaching experience is not required; personal yoga practice strongly desired. Summer teaching hours are 8:15-4:30 pm M-F, must work full weeks. Aftercare coordinators work from 3-6 pm or 11 am-6 pm M-F depending on staffing needs and interest. Apply! Yoga Camp Assistants – We are looking for candidates who love kids to help run our DCPS day-off and summer camps. Our assistants are part of our leadership team, but do not need yoga teaching experience. Our day shift is 8:15 am-4:30 pm M-F. Our afternoon shift is variable by week, 11 am-6pm or 3-6 pm M-F. We are looking for candidates who can work full weeks or a regular multi-week schedule (ie. Tu/Th) for the afternoon shift. Teens 14 yrs+ welcome to apply. Candidates 18 yrs+ must present a recent background check or be willing to undergo one. Apply! Yoga Camp CITs – Counselors in training ideally are at least 12-year-old volunteers who participate in summer camp and assist counselors in group management and activity preparation or logistics. Rising 5th and 6th graders will also be considered. This is a volunteer position. Bookkeeper/Administrative Assistant – This is a very part-time position helping the owner stay on top of deposit, bills, payroll, etc. Requires knowledge of Quickbooks and small business accounting. Hours are extremely flexible. Could be combined with customer service and other administrative duties for additional hours. Pay commensurate with experience. and two references along. Background check required for any position involving children.